Have you checked out baby universe.com? Click above to get a great coupon - $5/$25 purchase. They sell everything from diapers to clothes, from furniture to bedroom sets. 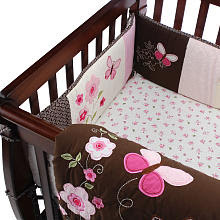 Love this crib set I saw for a girl - Carter's Flowers! So if you have or are expecting a little one - check them out today and see if you can get a good deal with the coupon they are offering right now!